Clash of the Egos: Honor! This world is Lost! There is no Honor, no code of honor. I ain't mean it in a religious way. Just the strictly honorable sense. A human being without Honor is not a human; simply a beast that only satisfy his/hers instincts. This was without a doubt one of my personal catharsis! I am just sick of people that sell themselves as "honorable" when is obvious they have no idea what it means to be honorable and behave accordingly. What happened to the times when a man was banished from society for his lack of honor? Nowadays society reverence the ones that have no honor! 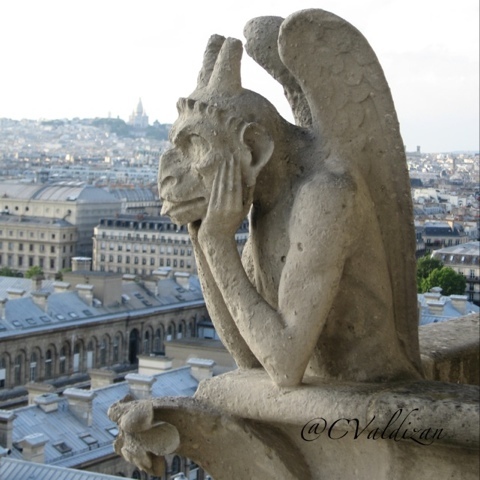 I took this picture a few years back at Notre Dame de Paris. It means a lot to me. For me represents the light and darkness inside all of us. My dear gargoyle! It's a shame how we are walking away from our moral principles.